Bliss balls are convenient wee gems of chocolaty goodness, perfect for any time of the day (or night). When I have them in the house, I may have one (or three) for breakfast with fruit, when I’m craving a sweetie treatie or needing some energy before I hit the gym. They are super easy to make, keep well and can be frozen and then eaten straight from the freezer. I’ve adapted this recipe from a traditional bliss ball recipe I was given years ago to make them healthier and even yummier, with the addition of a dash of spice and the hint of orange. 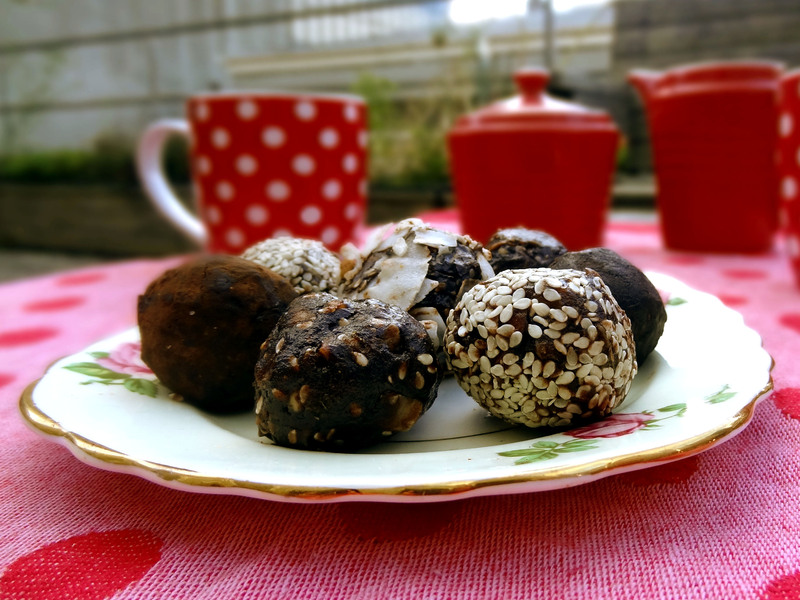 These delightful chocolate spice bliss balls are vegan, gluten-free, sugar-free and jam packed full of energy. They also have a high cocoa content – which means you get the chocolaty hit and numerous health benefits. Cocoa is doing great things out there in the big, wide world – it has a large component of flavonoids , which are an effective antioxidant. These flavonoids are known to decrease blood pressure, improve blood vessel health and reduce cholesterol levels. Cocoa also has an uplifting effect on mood due to its content of phenylethylamine, which has a mood elevating effect somewhat akin to amphetamine-type substances. And my, doesn’t it feel good to be doing good. In a saucepan, bring the wet ingredients to the boil, stirring constantly. Continue to boil for a few minutes. Add the wet ingredients to the dry ingredients and mix well. Form into balls as big or small as you like. Roll in coconut, cocoa powder. sesame seeds or leave plain. Put in the fridge on a baking paper-lined tray and allow to rest. Enjoy any time for a chocolaty energy hit, sans guilt and a sickly belly.